Dubai’s Roads and Transport Authority (RTA) has announced a partnership with US technology firm Next Future Transportation to test autonomous pods in the emirate. The NX1 pods are designed to travel short and medium distances in dedicated lanes at an average speed of 20kph and can be coupled in 15 to 20 seconds or detached in five seconds. Each measures 2.87m in length, 2.24m in width and 2.82m in height and weighs about 1,500kg. They have a capacity for 10 riders, with six seated and four standing, and can operate for three continuous hours before a six-hour recharge. The RTA said the pods are fitted with cameras and electromechanical technologies for the coupling and decoupling process, which can be activated in-motion. There are also safety systems to prevent crashes. “The prototypes of these units are manufactured in Italy and shipped to Dubai to put them on trials. These pods run on a virtual pre-configured and programmed lane and are overseen by the operational system,” said RTA director general and chairman Mattar Al Tayer. The agreement appears to build on plans first announced by Dubai ride hailing service Careem in October 2016 when pods bearing the RTA logo were displayed at the Gitex technology show. The RTA said the test came within the framework of the Dubai Future Accelerators programme, which sees public entities partner with the private sector to address key challenges. Its challenges under the third edition of the programme was to “create a sustainable and integrated framework for autonomous transport legislation, testing, and operation in an urban context, with a preference for clean and alternative fuels, as well as breakthrough technologies to support decision making and help cyclists and pedestrians travel in hot and humid climates”. At last year’s World Government Summit the RTA confirmed plans to trial drone taxis with Chinese company Ehang. The firm recently conducted its first passenger tests. Dubai is aiming for 25 per cent of public transport journeys to be driverless by 2030. 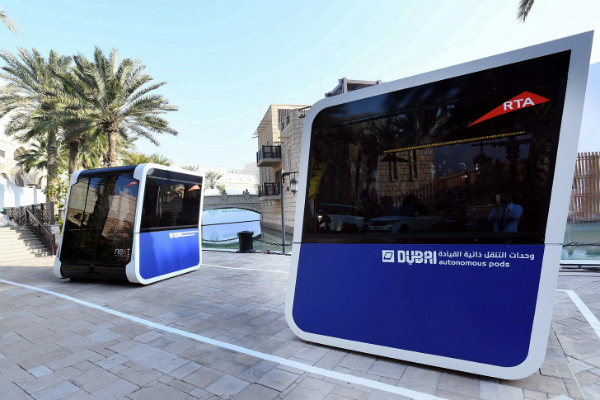 Driverless vehicles on preset routes have already been tested in various areas of the emirate over the last two years including in Downtown Dubai.